Sen. Kamala Harris, D-Calif., speaks at Vote For Justice: An Evening of Empowerment with activists and artists at the Newseum in Washington, D.C., in May 2018. Her campaign is highlighting that career, citing her experience on issues like sexual assault, housing and college affordability. Some of her proposals include middle-class tax cuts, rent relief, immigration and criminal justice overhauls, and Medicare for all. Harris's background in law enforcement could be a challenge in a Democratic primary, and she was asked on ABC about comments criticizing opposition to law enforcement on the left. "I think it is a false choice to suggest that communities do not want law enforcement," Harris said. "Most communities do. They don't want excessive force. They don't want racial profiling, but then nobody should." Harris is biracial — her parents were immigrants from Jamaica and India — making her only the second black woman and first South Asian-American person ever to serve in the Senate. 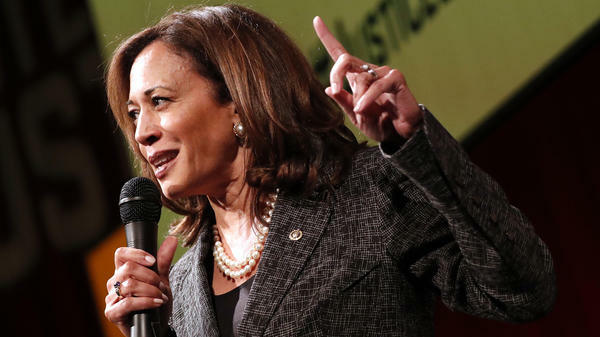 One of just three black current senators, Harris plans to embrace that background in what is likely to be a large and diverse Democratic primary field. Announcing her run on Martin Luther King Jr. Day, Harris' campaign says that is intended to highlight "a reminder of the aspirational fight for progress that marked Harris' upbringing and that guides her today." She has modeled her campaign logo on graphics used by the late Rep. Shirley Chisholm, the first black woman to run for president. Harris spoke of her parents' involvement in the civil rights movement on Monday. "That's the language that I grew up hearing, and it was about a belief that we are a country that was founded on noble ideals. And we are the best of who we are when we fight to achieve those ideals," Harris said. After arriving in the Senate in 2017, Harris quickly leveraged her seat on two high-profile Senate committees to become a national figure. Tapping into her prosecutorial background, Harris grilled Attorney General Jeff Sessions and Deputy Attorney General Rod Rosenstein in nationally televised intelligence committee hearings in 2017, then did the same last fall when the Senate Judiciary Committee questioned Supreme Court nominee Brett Kavanaugh amid allegations of sexual misconduct. A recent NPR/PBS Newshour/Marist Poll found that a majority of Americans — 54 percent — have not yet formed an opinion of Harris. But those who have a positive opinion of the California Democrat outnumbered those with a negative opinion by more than 3 to 1. Harris's announcement comes about a week after New York Sen. Kirsten Gillibrand kicked off her own presidential campaign, and three weeks after Massachusetts Sen. Elizabeth Warren became the first high-profile Democrat to launch a 2020 White House run. Former Housing and Urban Development Secretary Julián Castro formally declared a presidential run last week, as well, and several other Democrats have announced or indicated they will run, too. Unlike Warren, Gillibrand or Castro, Harris is not initially forming a presidential exploratory committee but instead immediately launching a full-scale presidential campaign. Harris has done little to hide her presidential ambitions. She traveled extensively for candidates during the 2018 midterm elections and made a stop in Iowa, which holds its caucuses before any other state holds primary contests. In the weeks leading up to her announcement, Harris made multiple high-profile media appearances promoting a recently released memoir. "There's an incredible amount of change that has happened in a relatively short period of time, and it has understandably had a lot of people feeling displaced, wondering and asking a question about where do they fit in, their relevance, are they obsolete," said Harris in an interview with NPR's Morning Edition earlier this month. "And [Trump] read it accurately. And then he took it to the lowest common denominator. [He said] it is us versus them instead of what real leadership would be about — which is to read it and say, 'Hey everybody, We're all in this together.' "
Senator Kamala Harris is running for president. The California Democrat made the announcement this morning. KAMALA HARRIS: My parents were very active in the civil rights movement, and that's the language that I grew up hearing. And it was about a belief that we are a country that was founded on noble ideals, and we are the best of who we are when we fight to achieve those ideals. GREENE: Senator Harris joins a growing field of Democrats looking to take on President Trump in 2020. And NPR's Scott Detrow is going to be covering the 2020 campaign and joins us now. Hi there, Scott. GREENE: OK, so no surprise there's been a lot of talk of her candidacy for some time now. What's her pitch? DETROW: Yeah, Harris has been a U.S. senator for the past two years. But she seems to be framing her run around her long career as a prosecutor, first as San Francisco district attorney, then California attorney general. So you're hearing that in her interview this morning with "Good Morning America" and also in the early videos and material from her campaign, talking a lot about representing voters just like she represented the state and the city in the courtroom. Of course such a focus on law enforcement could be a liability in a Democratic primary, where a lot of liberal voters are just pretty skeptical of law enforcement in the current environment. GREENE: ...That people can pick through when they're running for office. So tell us about her two years. DETROW: Yeah, she has really gotten a lot of national attention and got it pretty quickly based on her seat on some key Senate committees - the Intelligence Committee and the Judiciary Committee. She put that prosecutor background to use in hearings early on, really hammering Attorney General Jeff Sessions and other Trump administration officials during that series of nationally televised hearings about the Russia investigation. Same thing happened last fall during those contentious Brett Kavanaugh confirmation hearings for the Supreme Court. Like other Democratic candidates, Harris has spent a lot of time campaigning during the midterms. And she just got a lot of attention over the last few weeks on a national book tour promoting a new memoir that came out at a very good time if you're going to be running for president. DETROW: But, you know, it's still all relative. And as a new face on the national stage, she's going to have to work to get known by more casual voters who will be voting a year from now going forward. GREENE: And besides trying to get that name recognition, which is a challenge for many candidates, what other challenges does she face in this primary? DETROW: ...An era where Black Lives Matter is a very powerful force in Democratic politics. At the time she was a prosecutor, she was a high-profile, prominent liberal prosecutor. But the ground has really shifted a lot since her time in the DA's office, and she's going to face a lot of questions from voters. She is adamant that voters don't want to make what she calls a false choice between policing and racial justice. And you could hear her trying to walk that balance during her interview this morning. HARRIS: It is a false choice to suggest that communities don't want law enforcement. Most communities do. They don't want excessive force. They don't want racial profiling. But then nobody should. DETROW: You know, but Harris is in a unique position here. She's a black woman. Her father was Jamaican. Her mother is Indian, one of just three black U.S. senators. So expect her to talk a lot about that background and life experience as she tries to distinguish herself in a crowded Democratic field. The fact that she was announcing her run on Martin Luther King Jr. Day was very purposeful. GREENE: Well crowded field - like, really crowded - like, we're talking maybe as many as two dozen candidates when things actually get started. So who's next? DETROW: Well, she is the third high-profile candidate to make it official announcing - joining Elizabeth Warren and Kirsten Gillibrand, two other senators. Several other big names - we're waiting to hear their announcements, including New Jersey Senator Cory Booker, Vermont Senator Bernie Sanders. I think the one Democrat a lot of other candidates are waiting to hear from is former Vice President Joe Biden. If he decides to run, he will be an early frontrunner, a very serious candidate. GREENE: All right, California Senator Kamala Harris is running for president on the Democratic side, and we'll be awaiting more candidates joining that group soon - that news coming from NPR's Scott Detrow. Scott, thanks.